Powers/Abilities: The Scorpion Queen was an immensely large female scorpion-like six-legged demon with two pincers and a female upper body including a humanoid head. She possessed longevity, superhuman strength (proportional to her size), superhuman durability due to a carapace covering almost all her body except for her face and neck and superhuman reaction speed enabling her despite her size to attack with enormous speed with her pincers and scorpion sting. The former could presumably crush most beings with ease and the latter was presumably filled with poison. The Scorpion Queen had a brood of 40.000 scorpions. Some of them (presumably the youngest) lived under her helmet. The Scorpion Queen was immune to energy attacks. (Legion of Monsters: Satana#1 (fb) - BTS) - The Scorpion Queen lived in Satan (Marduk Kurios)' Hell realm and was mother to all vermin of Hell including scorpions. Wandering the caverns of Hell she fed on stray demons and purloined human souls. The soul of Jason Silence, who had been sent to Hell by Satana, as her monthly tithe to her father Satan was stolen by the Scorpion Queen. (Legion of Monsters: Satana#1) - Wandering the caverns the Scorpion Queen encountered Satana, who had come to Hell to retrieve Jason Silence's soul for his twin sister Jennifer. Homing in on the soul she found Jason's soul hiding nearby the Scorpion Queen, who assaulted her ferociously with her pincers. The Scorpion Queen didn't consider a soft flesh creature like Satana even a challenge because she ate her kind. When Satana attacked with energy blasts to no avail the Scorpion Queen released her scorpion brood on Satana. Engulfed by the scorpions Satana was mocked by the Scorpion Queen, but Satana managed to burn the scorpions away. Angered that her babies were killed by Satana the Scorpion Queen tried to sting Satana with her scorpion stinger, but missed. 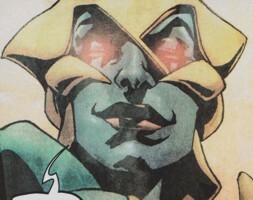 Satana jumped high up into the air and came down on the Scorpion Queen's head punching through her unarmored eyes apparently slaying the Scorpion Queen. With her last breath she told her scorpion brood to avenge her, but before they could Satana left Hell with Jaso Silence's soul. Comments: Created by Robin Furth (writer) & Kalman Andrasofszky (artist). 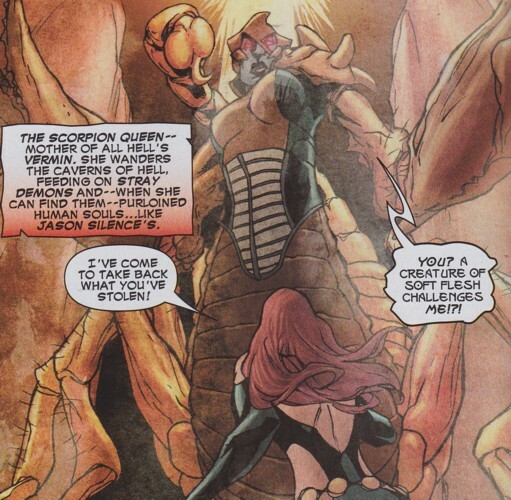 Most of the Scorpion Queen's offspring still live in the caverns of Hell.